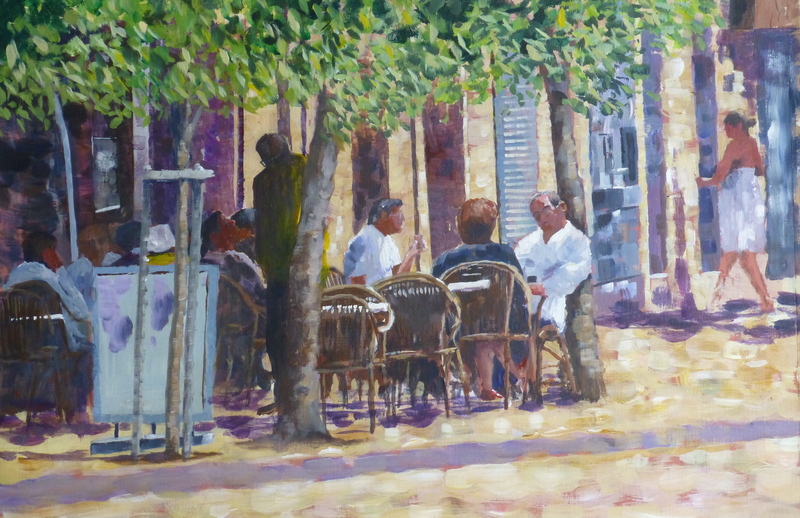 This is another in my café/France series I started a few months back. I put some of those paintings in a small exhibition at a local Bistro, though nothing sold. They were in the blocked style I have been experimenting in which may not be to everyone’s or anyone’s taste, but undeterred I thought I’d do another one. This was at a café in the south of France where we were eating and three musicians came by and started to play. Within seconds a couple jumped up and started to jive. It brightened up a dull day. I published the first version of this on 29th June and although I was happy with the style I felt I had included too many extraneous bits in the image. I wanted to concentrate on the three people enjoying their drinks in the sunshine and some other figures to provide the context. I also wanted to cut down some of the foliage, if you can excuse the pun, as well. Really, in the end it was just about making the central figures larger and focussing on what really matters.